Kevin Gallen scored one penalty and missed another as Plymouth eased past 10-man Derby in the FA Cup fifth round. 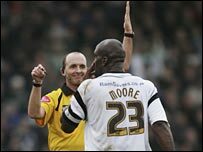 Darren Moore was the culprit on both occasions, first hauling down Gallen when clean through and then for climbing all over Krisztian Timar. Gallen's first penalty crept in via Stephen Bywater's parry, while the second was well palmed around the post. Moore's match ended with two bookings in three second-half minutes and Scott Sinclair sealed it with a late header. The visitors showed little of the form that has propelled them to the top of the Championship and were jittery throughout a match that was completely bossed by Plymouth. The hosts were rarely overawed by the 20-point gap between the two sides and the inventive Sinclair almost broke the deadlock inside 10 minutes when he forced Bywater into a leaping save from a curling effort. Billy should put the squad back the way it was. Why change a winning formula? And it wasn't long before Plymouth's early zest was rewarded when Gallen stroked home from the spot. The canny striker was chopped down when clean through by Moore after the lofty defender failed to deal with a high bouncing ball. Moore was not even shown a yellow card but, being the last man, could easily have been dismissed. Bywater guessed correctly but could only parry the effort on to the post and the ball then dribbled over the line. Plymouth had their keeper to thank for keeping the score at 1-0 when he denied Luke Gosling's bending effort with a magnificent finger-tip save. But Bywater's excellence between the posts was soon undone by the giant defender ahead of him. Moore clumsily climbed all over Timar and sent him crashing to the deck, with referee Mike Dean pointing straight to the spot. Gallen was made to wait to take his penalty and Bywater this time outwitted the veteran and palmed his effort round the post after choosing to put it the other side. Derby's first and only chance of the half fell to Stephen Pearson who, with his weaker right foot, mistimed his strike and saw his chance bobble through to Luke McCormick. Giles Barnes and Jon Macken were introduced at the break as Derby looked for a way back into the contest. Macken breathed fresh life into the Derby front line with two fierce left-foot strikes that were well saved by McCormick. But Derby's chances of clawing their way back into the tie were effectively ended when Moore collected a deserved two bookings in quick succession. The first for a reckless challenge from behind on Lilian Nalis and the second for scything down Gallen. Plymouth reasserted their authority from then on in and Sinclair sealed a deserved victory when the 17-year-old Chelsea loanee guided a fine header in off the post from David Norris' cross. "We had a bit of luck but we earned it and this was as a comprehensive display as we've had this season. "From the very beginning we set about them and that was pleasing. "We missed the penalty we didn't show a soft under belly and I am delighted that the way we played against a team at the top or our division." "In the opening 45 minutes they handled the conditions better they scrapped and got their opening goal and that proved crucial. "But in the second half we were better and came back into the match. "We knew they was a heavy pitch and that we would have to deal with the long ball but they got themselves sorted out more quickly than we did. "We also had Darren Moore sent off and that was also a turning point in the game." Plymouth: McCormick, Connolly, Timar, Seip, Sawyer, Gosling (Halmosi 77), Norris, Nalis, Sinclair, Ebanks-Blake, Gallen. Subs Not Used: Clapham, Hodges, Summerfield, Djordjic. Goals: Gallen 14 pen, Sinclair 83. Derby: Bywater, Mears, Moore, Leacock, Camara, Bisgaard, Pearson, Jones (Barnes 46), Smith (Macken 46), Howard, Seth Johnson (Michael Johnson 69). Subs Not Used: Peschisolido, Lupoli.